Browse metal-furniture suppliers by country and region. Short on time? Let metal-furniture sellers contact you. We are Offering wide range of Metal Furniture for you in our unique selection of Metal Furniture. Metal Furniture at wholesale prices. 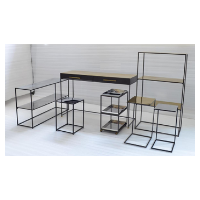 Metal Furniture for living room, bedroom, dining room, bar furniture,Contemporary metal table and chairs, Metal Garden Furniture, Metal Bed, chairs, Metal outdoor furniture, Metal office furniture, Metal Cabinets, Metal Racks, Hospital Furniture Metal Medical Furniture, Durable Metal Furniture and more. Changzhou Chaozhuo Furniture Co., Ltd.
Changzhou ChaoZhuo Furniture Co.,Ltd is specialized in designing and manufacturing computer desks and other office furniture, especially good at producing folding and adjustable table, bed. It has a modern plant about 20000-square-meter and more than 100 skilled employees, and its main products are laptop carts, computer desks, TV stands, bookshelves, sofa bed. It can produce more than 200,000 units of all kinds of desk and metal furniture annually We have advanced equipments production lines and skilled workers to manufacture high quality furniture in order to create a comfortable, elegant and highly efficient office space for you. We have electrophoresis workshop and mould work shop. So we can make mould and then we can painting products by ourselves. Welcome international and native customers to visit our factory and cooperate with us. Offering an exhaustive range of marble inlays bench that are beautified with intricate designs to enhance the grandeur of big halls and used mostly as outdoor furniture for gardens. Products can be in single piece [statues / silver furniture etc.] or in parts [pillars / fountains etc]. So products parts are numbered for assembly and packed individually. First the product is covered with brown paper / corrugated sheets. Then it is packed in thick bubble wrap and stuffed with paper scrape and thermocol sheet is kept on all sides. Then it is packed in wooden or ply box and iron striping is done on it. Finally name and address is written on this wooden box.